==>*You can get 2 pairs of socks with a delicate gift box. ==>*Fits US sizes 6 to 12,luxurious comfortable combed cotton will keep your feet toasty cozy and warm. ==>*Socks are made of 80% combed cotton,15% spandex,5% elastic.Wear-resistance,pilling resistance,funny anti-slip design and machine washable with alike colors. ==>*You can purchase our comfortable combed cotton socks with absolute confidence.We think that you will love our items,but if you are not satisfied in any reason,we offer 30-DAY money back and 24-hour customer support. 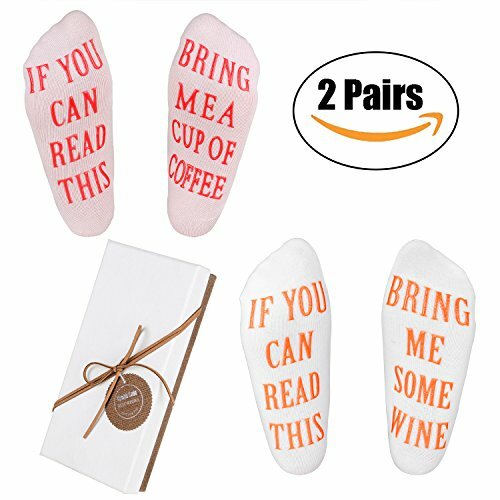 ★PACKAGE INCLUDES:You can get 2 pairs of funny cotton wine socks with a delicate gift box. ★ONE SIZE FITS MOST:Fits US sizes 6 to 12,luxurious comfortable combed cotton will keep your feet toasty cozy and warm. ★LUXURY VERSATILE MATERIALS:Socks are made of 80% combed cotton,15% spandex,5% elastic.Wear-resistance,pilling resistance,funny anti-slip design and machine washable with alike colors. ★QUALITY WITH A GUARANTEE:You can purchase our comfortable combed cotton socks with absolute confidence.We think that you will love our items,but if you are not satisfied in any reason,we offer 30-DAY money back and 24-hour customer support.